The Board of Control for Cricket in India (BCCI) will strictly go by the decision of the Government of India on holding a Test match between India and Pakistan at Ahmedabad next month. Australian leg-spin genius Shane Warne today brushed aside the controversy over rival Muttiah Muralitharan’s bowling action, saying he did not believe the Sri Lankan spinner was a chucker. South Africa celebrated victory in their one-day series against England in anti-climatic circumstances when the penultimate game was washed out. Having lost yesterday’s match to England U-19 team, the Indian colts struck back with vengeance winning the fourth one-dayer by 10 wickets with 21 overs to spare at the Eden Gardens here today thus sealing the series in the home teams favour. India and Jordan have submitted their bids for the 2014 Asian Games, though Korea, Japan and Kuwait are also expected stake their claims before the bids open on March 1 at the Olympic Council of Asia (OCA) headquarters in Kuwait. The bids will be finalised in September this year. The Himachal Pradesh team was declared the best all-round team in both categories in the National Junior and Sub-Junior Skiing Championship which concluded on the Solang ski slopes, 13 km from here, yesterday. Hosts Maharshi Dayanand University Rohtak (MDU) and Choudhry Devi Lal University, Sirsa (CDLU), shared honours on the opening day of the inaugural edition of the All-India Inter University Wrestling Championship for women which commenced at MDU Sports Complex here today. The CDLU grapplers clinched gold in 48 and 63 kg weight categories whereas MDU girls returned with gold from their bouts in the 55 kg and 72 kg class. Zi Yan and Jie Zheng of China stunned Olympic gold medallists and compatriots Ting Li and Tian Tian Sun to lift the doubles title in the $ 140,000 WTA Hyderabad Open today. Bhaichung Bhutia struck a spectacular goal as East Bengal pipped Salgaocar Sports Club 1-0 to register their fifth consecutive victory and consolidate their position at the top of the table in the 9th National Football League here today. Sandeep Singh Gill was today declared best athlete in men’s events on the second day of the sixth annual athletic meet of Institue of Engineering and Technology, Bhaddal, here. He won gold in 100m, 200m, 400m, and 800m races. The Board of Control for Cricket in India (BCCI) will strictly go by the decision of the Government of India on holding a Test match between India and Pakistan at Ahmedabad next month. This was disclosed by Mr Ranbir Singh, President of the BCCI, exclusively to The Tribune while he was attending a private function near here late last evening. The issue of holding a Test match at Ahmedabad has become a bone of contention between India and Pakistan, with the latter insisting that playing in Ahmedabad would pose a security risk to the visitors, keeping in view their experience of playing at that venue during their last tour of India. While the BCCI has taken the stand that it would abide by the government’s decision, there should no hitch in finalising the schedule of the visitors, who will be touring India after a long gap. The venues of the three Tests and five one-dayers which the visitors would play during their tour of India will be finalised by the Working Committee of the board which is scheduled to meet in the national capital on February 17. But Mr Ranbir Singh said the BCCI was still keen to allot the Test to Ahmedabad, given the fact that the Gujarat Cricket Association (GCA) had spent a lot of money and effort on making all arrangements for hosting the match. He himself has been in touch with Mr Narhari Amin, President of the Gujarat cricket Association, on a day-to day basis. However, he did not agree with the assertion of the GCA that Pakistan’s tour of India should be cancelled if the team did not want to play in Ahmedabad. “Any cricket series between the two countries in more than cricket,” Mr Ranbir Singh asserted. In case Ahmedabad is denied a Test match then it will be Kolkata’s turn to host a Test match although the team of the Pakistan Cricket Board which had toured india last week to examine the venues of the matches, was keen that the Test match be held at Chennai. When asked whether the BCCI would compensate Ahmedabad financially for missing out from hosting a Test match for no fault of their own, Mr Ranbir Singh said it was not within his powers to offer any financial compensation to the GCA. According to one estimate the GCA stands to lose about Rs 2 crore if the the match is shifted out of Ahmedabad. The BCCI chief was non-committal when asked whether a one-day match between the two teams would be played at the Ferozeshah Kotla given the fact that the renovation work of the Delhi stadium was still not complete. He said the BCCI was hopeful that the renovation work at Delhi would finish in time and the match held as per schedule. In case the match could not be held in Delhi then the match would be offered to the next unit by rotation, provided that unit had not hosted a Test match of the India-Pakistan series. The BCCI President repeated his view that what had happened at the PCA Stadium at Mohali on Thursday was “very unfortunate”. But he was very thankful that the miscreants were unsuccessful in their bid to damage the playing arena. “But their mischief has made every staging association very alert on providing top class security to their respective venues,” Mr Ranbir Singh disclosed. The BCCI President disclosed that the Indian team would attend a very short warm-up camp just prior to the series against Pakistan. He said all the players were fit and had played in the Challenger Series and, therefore, a long-duration camp was not called for. The unseeded 18-year-old, backed by a vociferous crowd, held her nerve in a scintillating final to beat ninth seed Alyona Bondarenko of Ukraine 6-4, 5-7, 6-3 at the Sports Authority of Andhra Pradesh complex here. It turned out to be a battle of nerves for both Sania and Bondarenko, both of whom were playing in their maiden WTA tour final, as they looked more than anxious to finish off the points and committed too many unforced errors in the bargain. And Sania, two years younger to her 102-ranked opponent, handled the pressure better in the two-hour encounter to send her thousands of supporters in to wild celebrations. It was the third and final set which proved that the Hyderabadi girl had nerves of steel as she broke her opponent in the first, third and fifth games to race to a 5-1 lead and then managed to ward off tremendous pressure after dropping one match point and a service game to clinch the title. It was not the best of starts for Sania, as she committed three double faults in her first service game to concede a 2-0 lead to Bondarenko in the first set. But, with the set almost there for her to win, Sania seemed to get a bit over anxious to finish it off quickly and committed a number of unforced errors to put herself under pressure. 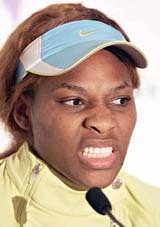 In fact, the local favourite wasted as many as nine set points and had to save three break points on her serve in the 10th game before wrapping up the set. The second set began on a promising note for Sania as she got the break of serve in the very first game. Sania lost her serve in the second and sixth games to trail 2-5 and it was a spate of unforced errors by Bondarenko which helped her to hold serve in the eighth. The problems with shot selection once again surfaced at this stage as Sania wasted three game points to lose the set 5-7 and take the match to the decider. The decider, however, turned out to be a one-sided affair as Sania raced to a 5-1 lead and then ensured that there were no last-minute blues. “The most important thing is that he (Muralitharan) does not chuck,” Warne was quoted as saying in the Colombo-based Daily News. The in-form Herschelle Gibbs had held South Africa’s rain-interrupted innings together with his second century of the series as England dismissed the home side for 211 in 46.3 overs. The touring side then struggled in the increasingly difficult conditions to seven for two under the lights before the rain returned. England needed to win to try and salvage the seven-match series. South Africa, having won the last three matches, lead 3-1 with one game to go, at Centurion on Sunday. The toss looked crucial and South Africa won it but they made heavy work of batting first. Gibbs’s 118 proved crucial — the next highest score was 27. He had come in with the score on one for two in the fourth over after medium pacer Alex Wharf, in his first game of the series, removed Graeme Smith (one) and Jacques Kallis for a golden duck with consecutive deliveries. 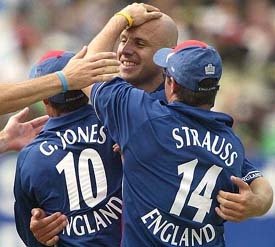 Smith edged to Marcus Trescothick at first slip and Kallis attempted to pull his first ball and sent it looping over his shoulder to Andrew Strauss at second slip. But Gibbs, who faced 133 balls and hit 10 fours and a six for his 15th one-day century, rebuilt the innings, first with opener Adam Bacher (15) with a stand of 52 and another 61 with Ashwell Prince. There was another partnership of 55 with Mark Boucher before England took the last six wickets for 42. Wharf finished with three for 48 and Kabir Ali three for 44 but Darren Gough put on a masterclass with two for 14 off nine overs. When England replied, Shaun Pollock and Makhaya Ntini found good movement in the increasingly damp conditions to remove Marcus Trescothick, caught at second slip off an attempted guide to third man, and Geraint Jones, off a miscued pull, before the rain returned. FoW: 1-1, 2-1 3-53 4-114 5-169 6-171 7-180 8-208 9-208. Bowling: Gough 9-2-14-2, Wharf 9-1-48-3 (nb-1 w-1), Ali 8.3-0-44-3 (nb-1 w-2), Collingwood 5-0-35-1 (nb-1), Giles 10-0-38-1, 5-0-24-0. India are leading the five match series 3-1. Chasing 174 to win, the Indian team coasted to 175 for no loss in 29 overs. The Indian onslaught was led by K.A. Srikanth, who hit 88 off 74 balls with 13 fours. He cut and drove with uncanny ferocity as the English players went on a leather hunt all round the park. OCA Secretary-General Raja Randhir Singh said here today that India were the strong contenders to win the bid. India, who initiated the Asian Games movement by playing host to the inaugural edition of the games in New Delhi in 1951, had to wait for over 30 years to host the games for the second time when the ninth edition was held in New Delhi in 1982. Randhir Singh, who is also a member of the International Olympic Council (IOC) as well as the Secretary-General of the Indian Olympic Association (IOA), addressing the delegates of the South Asian Regional Forum here today, said cricket has been dropped from the 2006 Asian Games at Doha. He said the Asian Cricket Council insisted on fielding only the Under-19 teams which was not acceptable to the Doha Asian Games Organising Committee as they wanted full national teams to play in the Asiad. However, Randhir Singh indicated that India would be including cricket in the roster of events for the 2010 Commonwealth Games to be held in Delhi. But cricket can be included in the games only if the Board of Control for Cricket in India (BCCI) agrees to field the national teams as the International Cricket Council will only go by the advise of the BCCI. The Chinese province of Guangzhou will host the 2010 Asian Games. China will also be hosting the 2008 Olympic Games. Randhir Singh said it was essential for the BCCI to field teams in multi-sport events like the Asian Games and the Commonwealth Games to widen its reach and base. Randhir Singh also warned against any sort of interference in the autonomy of the National Olympic Committees as the OCA and the IOC charters were very clear in keeping the NOCs outside the purview of extraneous influences. The championship was organised by the Directorate of Mountaineering and Allied Sports, Manali, with the assistance of the Himachal Pradesh Winter Games Association under the aegis of the Winter Games Federation of India. Results: Giant slalom: Sub-junior girls (11 to 12 years): Himika Sharma,Himachal (Red) 1; Varsha, Himachal (Red) 2; Sonia Thakur, Himachal (Blue) 3. Giant slalom: Sub-junior boys (11 to 12 years): Rajat Thakur, Himachal (Red) 1; Shivam Kainthla, DMAS, 2; Suraj Thakur, Himachal (Red) 3. Hazam, Jammu and Kashmir, 3. Giant slalom: Sub-junior girls (13 to 14 years): Shilpa Thakur, Himachal (Red), 1; Puja, Himachal (Red), 2; Shiny Bhanu, Himachal (Red), 3. Giant slalom: Junior girls (15 to 18 years):Deepa Thakur, Himachal (Red), 1; Sheetal Negi, Himachal (Red), 2; Deepti Dimri, GMVN, 3. Giant slalom: Junior boys (15 to 18 years): Kapil Thakur, Himachal (Red), 1; Arif Mohd Khan, Jammu and Kashmir, 2; Vipinder Kanwar, GMVN, 3. Slalom: Junior girls (15 to 18 years): Sheetal Negi, Himachal (Red), 1; Parineeta Chauhan, Himachal (Red), 2; Phuldei, Himachal (Red), 3. Slalom: Junior boys (15 to 18 years ): Kapil Thakur, Himachal (Red), 1; Santosh Kumar, GMVN, 2; Deepak Thakur, DMAS, 3. Kapil Thakur of the Himachal team was declared all-round best skier among junior boys and Sheetal Negi of Himachal was declared all-round best skier among junior girls. Capt Randhir Singh Salhuria, Deputy Director, Mountaineering and Allied Sports, Manali, and organising secretary of the championship, said the closing ceremony of the championship was held in the auditorium of the DMAS . Brig V.K. Chopra, vice-president, Indian Rafting Federation, presided over the function. Brig D. Kapil, officer in charge, Snow and Avalanche Study Establishment, Col H.S. Chauhan, president, HP Winter Games Association, were also present at the closing ceremony. Bronze medallist of the Asian Cadet Championship, held at Kazakistan in 2004, Poonam won gold medal for MDU in 55 kg class defeating Tripta of Punjabi University, Patiala. Kavita, also an international grappler, provided the hosts with second gold of the dav. She defeated Jyoti of CCSU Meerut in 72 kg weight category. Gitika Jhakhar, Medallist of the Asian Championship, won gold in 63 kg weight category for CDLU. Babita Singh of the CCSU Meerut emerged silver medallist in this category. Her compatriot Sunita defeated Rupener Kaur of GND varsity Amritsar to bag gold in the 48 kg weight. Earlier, the championship was inaugurated by the president of MDU Sports Council Dr S.S. Goel. Girls from nine varsities are taking part in the two day event which has been included in the scheme of All-India Inter University Championships for the first time. 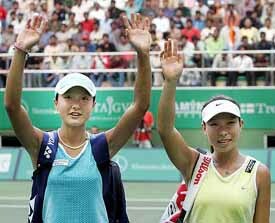 Yan and Zheng, who became the first Chinese women to reach a Grand Slam singles fourth round at the French Open last year, were in total control and never really threatened by their fancied opponents, cruising to a 6-4, 6-1 victory at the centre court of the Sports Authority of Andhra Pradesh tennis complex. Seeded third, Yan and Zheng seemed a confident lot from the word go and took a 2-0 lead in the opener and 3-0 in the second set to assert their supremacy. Ruchika (III yr) Computer Science Engineering and Ramandeep (II yr) Electronic and Communication Engineering, were adjudged best athletes in women’s events. Ruchika finished first in 100m, 4X 100m relay race and second in 400m race while Randeep finished first in javelin throw and second in triple jump. In other women’s events, Anshu won gold in 200m, Mehak in 400m, Jasmeen, Shweta, Jaspreet and Ruchika in 4x100m relay race. In men’s events, Jatin, Kishore, Aashish, Mastan Singh won gold in 4x100m relay races.